I hit up Pandemonium games yesterday and picked up a bunch of interesting stuff. I found a bunch of Voystroyans to add to my Imperial Guard army, as well as a female guard model with a grenade launcher. I've been steadily collecting an all female command squad, so this will help. 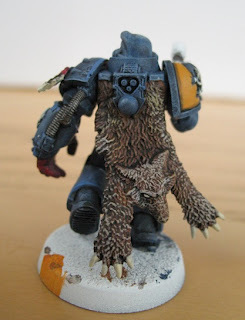 I also found a neat wolf rune priest. 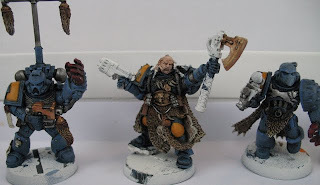 I have never played Space Wolves. In fact as Dan Abnett even referenced, I found their fluff a little one dimensional. However, given all the time i have on my hands, and my need to prove I can paint again, I thought it would be fun to give another chapter a go. Wow. 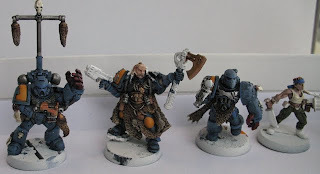 I really enjoy painting Space Wolves I have no idea if I will ever paint enough to field them, but I really enjoy it. 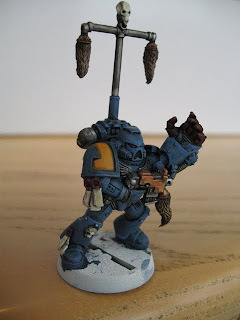 I converted an AoBR marine to be some kind of blood claw wielding a banner, as well as another marine with PF. I decided to try and stick with older looking armor, since the wolves seem to be the least well equipped. The wolf recipe was pretty easy, and I will post it if anyone is interested. I do have a few more work in progress shots. 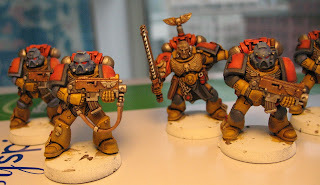 I just finished two more marines so the Angels Tempest at least have one legal 5 man squad. Still lacking bases, perhaps when the rains end here in Cambridge I may go out and try to buy some basing material. I think they look better as a squad. So the Angels Tempest exist because I had to have surprise heart surgery, and while I am recovering I am staying with my parents. The Angles Tempest have no back story. There is no IA for them. Any ideas? 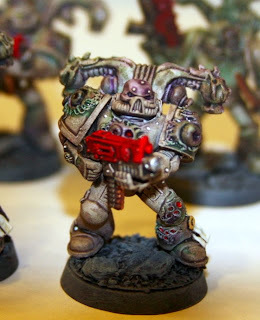 While deciding what to paint next, I thought I would post a close up photo of one of my green stuffed plague marines. 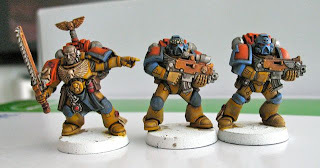 These guys are not finished, but I could not resist basing them and playing around with washes. Like the Angles Tempest, these guys got a bad grainy white prime job, but in their case I think it looks good. In terms of what to paint next. 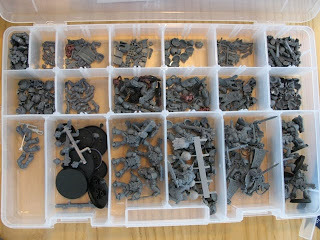 I have more ATs to do, but I have a box full of space wolf parts. The weird thing is that I have only 4 assault marine legs, but nearly 30 torsos. how did this happen. Where have all the legs gone? Does anyone else have this problem? Oh, one more thing. I have a first edition squat army. I'll post picks in a couple of weeks. I painted up two more of the AoBR marines this afternoon. I am still fighting with the primer and the color scheme. The white dusting is really visible on the images, but not so bad when viewed at tabletop distance. I am really unsure of the color scheme. 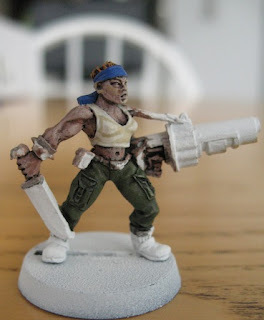 I think I need to desaturate everything and produce clean looking rather than dirty looking models. 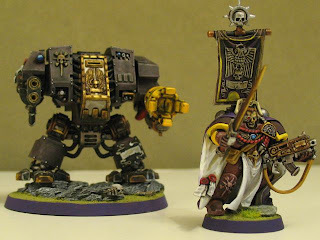 I miss the days of GW inks! I wish I had basing materials here, but no such luck. Since I've got time on my hands, it would be a good time to finally experiment with snow and water basing. My original intent was to paint up a small 750 pt force and get some games in at Pandemoniam games here in Cambridge, but I think I might just have to ease up on that goal. I might just try to paint one full squad. 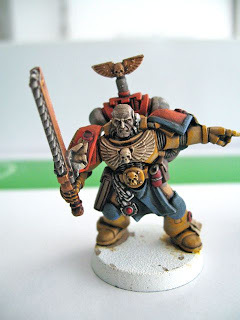 I will be like the random 'Other Marines' that show up supporting my blood angles or something. I may have been a bit too ambitious post surgery with my painting. The mini did not turn out the way I intended, but I think it has helped rebuild my skills. I am not sure I want to paint up the remaining 9 of them in this scheme. I don't have simple green here since I am not at home, so I can't strip off the bad priming. I am going to look for a better camera so I can post some better shots. The wash made the mini a little grittier than planned, but hey, it the surprises that make painting fun! I have been thinking about the chapter symbol and have decided to use a half starburst with a white skull. So I had a brief spin back to cleveland, and am not back in Cambridge. 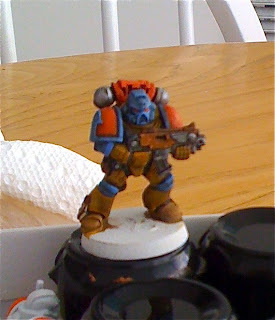 Last night my wife helped me prime a bunch of AoBR marines to use as a test for my new color scheme. I hate white primer. One more time. What is it with this stuff. 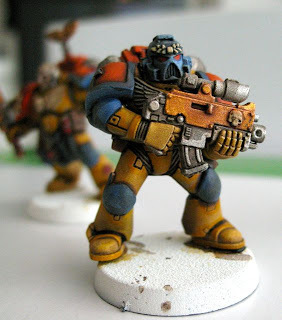 Half of the time it produces white rough dust all over the miniatures. I took an old brush and 'sanded' the worst of the power off, and will probably paint these up anyway. The question I have is why I am able to flawlessly prime with black every single time, but that white primer is a crap shoot I usually loose. 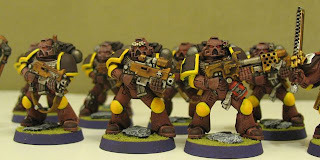 I will post photos as I paint up the marines. 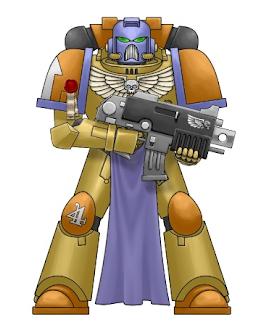 My first space marine chapter is the the Iron Scythes, or Ferum Falux Chapter. The Angels Tempest outline is very similar, but I love the detail. 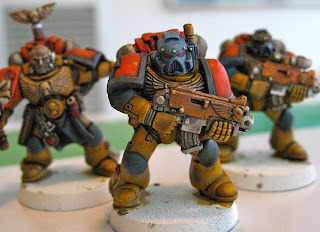 After painting blood angels for a while, I am ready for more complex painting again. I am not sure the Angels Tempest are different enough. My technique has changed quite a bit since I started the Iron Scythes more than a decade ago with the RT plastics. I used to paint directly out of the pot. Recently I have been watering down my paints quite a bit, or using an acrylic thinner. I like the way detail is kept with the new style, though colors are not as vivid. heavy drybrush rust colored red (some old Ral Partha paint) over the whole body. 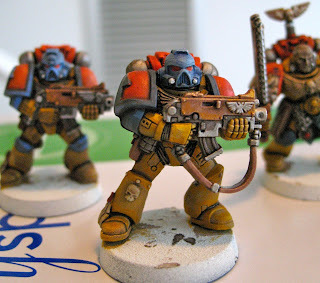 Paint the tops of the feet the shoulder pads and the backpacks with dark brown. 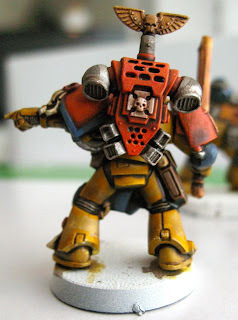 Paint elbows, knee pads and should trim in golden yellow. So I had surprise open heart surgery a few weeks ago, and am very lucky to be alive. I feel ok now, and am recovering away from my home. I hope this explains the long delay between posts! Recovery takes a long time, so I have plenty of time to paint. I have a bag full of paints, and some miniatures purchased with the help of my wife and my parents. Sometimes life throws you a curve ball it seems.